Seeking protection from the sun and rain can be difficult when you are using a wheelchair or rollator for obvious reasons, but this new product can provide the solution. 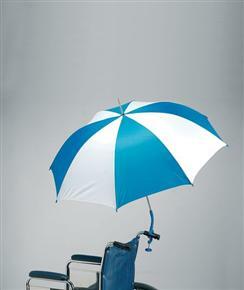 It’s a fully adjustable umbrella that attaches to either of these mobility aids with a specially made bracket. It can be easily set into a number of different positions, its capable of shielding a carer and a wheelchair user and can be easily folded down or removed completely when no longer needed. It provides high quality protection from both sun and rain.